Difficulty: Methuen Rail Trail; Easy. Flat paved rail trail. Salem Bike-Ped Corridor; Easy. Flat, partly paved rail trail. Windham Rail Trail/Derry Rail Trail/Londonderry Rail Trail/South Manchester Rail Trail; Easy. Flat paved rail trail. Derry Loop Trail; Moderate. Trail consists of paved sections, stone-dust sections and on-road sections. Some hilly sections. To start from Manchester Street Park in Lawrence [Southern End]; From I-93 take exit 46 to Route 110 east. Bear left on Woodland St and follow to a traffic circle. Follow around to Manchester St, traveling underneath the old RR bridge and take your first left into the Park. Note; There are no Park entrance signs. To start from the Main Street Municipal parking lot in Salem; From I-93 take exit 2 to Pelham Rd and head east. Pelham Rd becomes Main St. Just before Route 28 the parking lot will be on your right next to Central St.
To start from the Depot Road parking lot in Windham; From I-93 take exit 3 to Route 111 west. Take a right on Church St and another right onto N Lowell Rd. After traveling underneath I-93 you'll come to Windham Junction. Turn right up Depot Rd and you'll spot the "Blue Caboose" on your left. The parking lot is on your right. To start from Hood Park in Derry; From I-93 take exit 4 to Route 102 east. When you come to downtown look for a wide brick cross-walk. Just past this cross-walk turn left up Manning St and you'll come to Hood Park. To start from Route 102 in Derry [Derry Loop Trail]; From I-93 take exit 4 to Route 102 east. When you come to downtown look for a wide brick cross-walk. Just before this cross-walk take a right past the old train station, now the "Depot Square Steak House" and park near the rear. To Start from the Sanborn Road parking lot in Londonderry; Take exit 5 off of I-93 to Route 28 north. Routes 28 & 128 combine. Take your second right onto Sanborn Rd. Across from the North Londonderry Elementary School is a parking lot. To Start from the Manchester Commons Shopping Center parking lot in South Manchester [Northern End]; From I-293 take exit 1 to S Willow St (Route 28) north. Turn left when you reach Spring Garden St, then left on S Beach St. You'll immediately spot the trailhead on your left. Turn left and follow the road to a parking lot next to the trail. The Manchester & Lawrence Rail Trail follows the rail bed of the former Manchester and Lawrence Branch of the Boston and Maine Railroad. Starting in Lawrence, MA the proposed Lawrence Rail Trail will connect to the Methuen Rail Trail (Methuen, MA) which connects to the Salem Bike-Ped Corridor (Salem, NH) which connects to the Windham Rail Trail (Windham, NH) which connects to the Derry Rail Trail (Derry, NH) which connects to the Londonderry Rail Trail (Londonderry, NH) which will finally connect to the South Manchester Rail Trail (Manchester, NH). 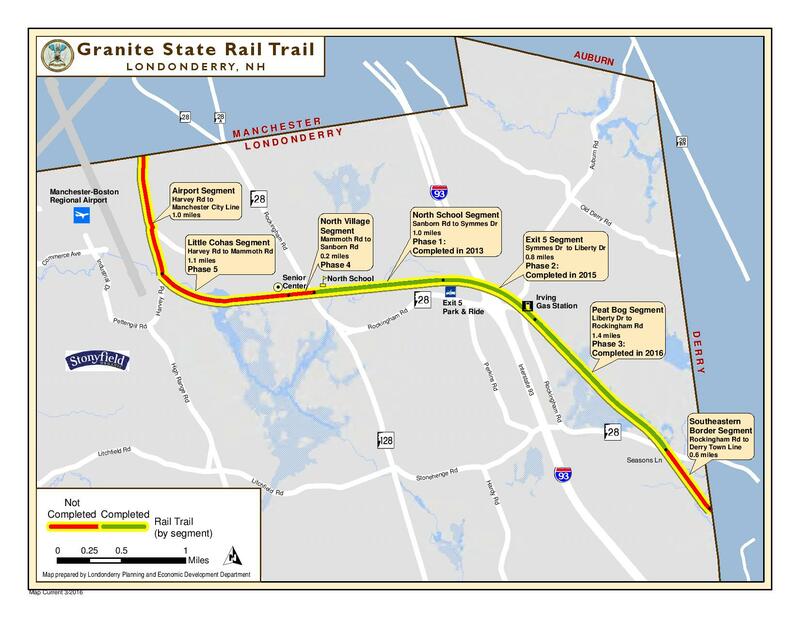 All the trail sections in NH are also part of the state wide Granite State Rail Trail, a proposed 120-mile trail extending from Methuen MA to Lebanon NH. You can also access the Spicket River Greenway from Manchester Street Park in Lawrence, MA. From the Windham Rail Trail you can access the undeveloped Rockingham Recreational Trail and in the future the proposed Windham Greenway. From the Derry Rail Trail you can access the Derry Loop Trail. For more information visit; Methuen Rail Trail , Salem Bike-Ped Corridor , Windham Rail Trail , Derry Rail Trail , Londonderry Rail Trail & South Manchester Rail Trail . See also; Manchester Trails . Starting from Manchester Street Park in Lawrence, MA; A sign board and picnic tables are located here. From the parking lot travel past the community garden and playground along the paved trail to a promenade that overlooks the Spicket River with the old Arlington Mills across the river. This paved trail with a wide white stripe is part of the Spicket River Greenway's northern endpoint in Lawrence. It heads right. A short section of this trail continues straight which is where you head. Just before a an old RR bridge that crosses the river turn left and follow a stone-dust trail back alongside the park and up an embankment. This will bring you up to the old rail bed just shy of 0.4 miles. To your left is the old double track RR bridge across Manchester St. This is where Lawrence has future plans for the Manchester & Lawrence Rail Trail. Heading right from the bridge the paved Methuen Rail Trail travels above the river and old mills along your right. Travel underneath Oakland Ave and across Union St before passing by the old Methuen Railroad Depot (1907). You then pass by the Railroad Street parking lot after 1.5 miles. A tunnel takes you underneath Osgood & Lowell Streets. After crossing over the Spicket River you enter a Bird Sanctuary and leave the town behind. Travel underneath Route 213, then an old wooden road bridge at 2.1 miles. Travel past a large marsh and just before Hampshire Road you'll pass by the NH border post to your right as you enter Salem, NH. The trail ends after 2.8 miles. Starting from Hampshire Road; Continuing north from the end of the Methuen Rail Trail cross Hampshire Rd (Use Caution; No cross-walk) to the Salem Bike-Ped Corridor. Re-zeroing mileage. Note; The trail surface consists of recycled asphalt, which makes for a slightly bumpy ride. Future plans call for paving the trail. Pass by an old RR Mileage marker at 0.2 miles on your right reading M23/L4 (Manchester 23 miles/Lawrence 4 miles). Straight, open corridor between woods and marsh on your left and commercial to your right. Cross Kelly Rd at 1.1 miles (Use Caution; No cross-walk/Head right for a cross-walk) where the trail now along Route 28. Again, Use Caution; No cross-walk past the plaza entrance. Come to Cuff Crossing Rd at 1.8 miles where the developed section of the trail currently ends (Use Caution; No cross-walk). The old rail bed continues along Route 28 crossing busy Rockingham Park Blvd (Route 38) at 2.2 miles (Use Caution; No cross-walk). Cross Main St at 3.2 miles (Use Caution; No cross-walk/Head right for a cross-walk) and you'll pass by the old Salem RR Depot, which is now a Transportation Museum. Note; To your left just up Main Street is a Municipal parking lot. Here the trail is paved as it travels through an open plaza past a pergola and fountain. Cross Willow St where the trail is a bit more isolated as it travels alongside a large marsh and along a causeway. Cross Old Rockingham Rd at 3.9 miles. Travel up along a berm above Route 28. Travel over a "Cattle Culver" which is a culvert built underneath the RR tracks to allow farm animals access. Informational signs located along the trail. Travel past the site of the old Canobie Lake RR Station before coming to a map board. A cross-light over Range Road brings you to the Windham town line and the southern end of the Windham Rail Trail after 5 miles. Parking is located here, along with a Bike Station. Starting from Range Road; Continuing north from the end of the Salem Bike-Ped Corridor cross Range Rd and the Windham town line where the paved Windham Rail Trail continues north. The trail slowly pulls away from Route 28 before an iron bridge takes you over Route 111 at 5.5 miles where you travel through a rock cut into the woods. Cross Roulston Rd at 5.9 miles. Note; Future plans call for constructing a parking lot here. The trail now travels through deep woods with many marshes and rock cuts. Wooden Mile Markers are located at 0.5 mile increments. Cross a small bridge followed by a causeway through a large marsh (Flatrock Brook) at 6.8 miles. Pass by another large marsh (Mitchell Pond) and over a culvert for Flatrock Brook. Just past the 1 Mile wooden marker you'll find an old granite RR Mileage Marker (mile numbers have broken off). A bridge takes you over Mallard Rd. Come to the restored 1849 Windham Train Depot where you'll find a map board. Note; On your right just before the old train station spot a dirt trail and a sign reading "NH snowmobile club" This leads to the undeveloped ROCKINGHAM RECREATIONAL TRAIL . Across from the old train station sits the restored Freight Storage building, behind which you'll find the Depot Road parking lot. Porto-potty's located here. Note; Future plans call for connecting to the planned Windham Greenway Trail west of here. Cross Depot Rd at 9.2 miles passing by an old blue B & M RR caboose. A final rock cut takes you out to N Lowell Road at 9.4 miles where you'll find the wooden 0 Mile Marker. Just before this mile marker look east to spot an old RR mileage marker reading L13/M14 which meant Lawrence 13 miles/Manchester 14 miles. Across the road is the start of the Derry Rail Trail. Starting from N Lowell Road; Continuing north from the end of the Windham Rail Trail cross N Lowell Rd (Use Caution; No cross-walk) where the paved Derry Rail Trail continues north. Map board located here along with a 0 Mile Marker painted on the trail. Head into the woods. You'll briefly lose the tranquility of the trail as you skirt close to I-93. Travel past a large pond along your right before coming to Bowers Rd after 10.9 miles. You'll need to head right, then cross the road to return to the trail. Enter a residential corridor where a cross-walk takes you over Kendall Pond Rd at 11.6 miles. Cross the junction of Norton St & Hall Ave after 11.9 miles. Note; The Derry Loop Trail returns to the rail trail here. See Below. Continue north through a small rock cut and along a berm with green fencing. Beaver Brook runs below. This leads to the South Ave parking lot. Continue past the ball fields alongside a a cul-de-sac and across South Ave in Derry. This brings you to the old Derry Train Station and Route 102 parking lot. Map board located here. A wide cross-walk takes you over Route 102 at 12.4 miles. Travel through a small bricked lined garden park where you'll find a map board for the Derry Loop Trail. Spot an old RR Mile Marker here as well; M11/L16 or Manchester 11 miles-Lawrence 16 miles. The trail follows alongside Manning St & Courthouse Lane before crossing Rollins St to the Hood Park parking lot after 12.7 miles. Map board located here. Note; The Derry Loop Trail heads through the parking lot and past the basketball courts to a paved trail. SEE BELOW. Note; Heading north the undeveloped rail trail travels alongside Hoods Pond before ending near N High St. This 0.5 mile section is scheduled for construction in 2017. Another 0.5 miles remains undeveloped to the Londonderry town line. In Londonderry, another 0.5 miles remains undeveloped out to Route 28. This 1 mile segment in Derry and Londonderry is currently under study as part of the larger "Woodmont Commons" development. An on-road detour is required to connect to the Londonderry Rail Trail. See Below. Starting from the Route 102 parking lot along the Derry Loop Trail; Head north across the wide cross-walk to a small garden park. Here you'll find a map board along with an old RR Mile Marker; M11-L16 or Manchester 11 miles-Lawrence 16 miles. The trail follows a brick lined path along Manning St. The old "Grainery of Derry" building is across the street. The trail can be tricky to follow at times as some of the green "Bike Route" signs are missing. The only map I could find on-line is not as specific as the map board. The trail crosses the street near the courthouse and utilizes a bike lane (low traffic). You'll come to Hoods Pond & Hood Park after 0.3 miles. Head right through the parking lot to the basketball courts and take the paved trail. Note; The lower paved trail simply brings you down to the beach. The paved trail heads into the woods, turning to gravel after 0.5 miles. Bear right and you'll emerge at the end of a cul-de-sac (Mitchell Ave). Head on-road up Mitchell Ave and turn right on Franklin St Ext, then a quick left on Lincoln St (all residential). Take the cross-walk over Crystal Ave and turn left. A quick right will bring you back to a paved path at 3/4 miles. You come to an intersection with athletic fields on your left. If you continued straight up the hill you'd come to a small playground. STOP. You need to turn left towards the fields. The paved trail ends and turns to hard packed dirt as it travels around MacGregor Park, which is part of the middle school. You return to a paved path and continue around the fields and out to Peabody Annex at 1.3 miles. This begins another on-road section (although their are sidewalks available). Follow Peabody Rd Annex to Peabody Rd and turn right. Bike lane. Take a left when you reach Perley Rd (bike lane) and then a right when you reach Hoodkroft Dr (bike lane). this brings you to E Broadway (Route 102). No cross-walk is located here and this is a busy rd, so head left along a narrow sidewalk until you come to Crescent St. Here a cross-walk will bring you over E Broadway to the Derry Fire Dept. at 1.9 miles. A paved trail runs around the right side of the FD, past the cell tower and out to S Main St (Route 28 Bypass). Take the cross-walk over S Main St and turn right along the paved trail which parallels the road. At 2.4 miles you turn left into Derry Village Elementary School. The trail then crosses right in front of the school and heads uphill through the woods and passes in front of West Running Brook School. The trail heads right, out the entrance, to a cross-walk over S Main St. Turn right and follow the paved trail to Fairway Dr. Head left down the paved trail. Just before the road takes a sharp left, the trail turns right into an apartment complex and changes to a hard packed surface before heading through a Pine stand. After crossing a wooden bridge you head up a short hill and come to the Alexander Carr Playground, located at the end of Pierce Ave, after 3.5 miles. A parking lot is located here. From the parking lot the paved trail head left through a Red Pine stand, past another playground, tennis courts and out to Birch St. A cross-light takes you over to Summit Ave where you start an on-road (residential) segment. From Summit Ave take a right on Berry St, then a left on Norton St/Hall Ave. This will bring you back to the Derry Rail Trail at 4.2 miles. Turn right and follow the rail trail back to Route 102 for a 4.7 mile loop. Currently there is no parking available off Route 28 (southern end) and a gap exists between the Londonderry Rail Trail & Derry Rail Trail. Note; Heading right (West), the Londonderry Rail Trail quickly terminates at Sanborn Rd after 0.1 miles. The next section out to and across Rockingham Rd is complete. I have not checked out this section. The next mile out to Harvey Rd is scheduled for construction in 2018 or 2019 and the final mile north past the Manchester-Boston Regional Airport where it will eventually connect into the South Manchester Rail Trail is currently under study. Head left (East) along the paved Londonderry Rail Trail as it travels along a berm through the woods. Cross a stream a couple of times before Clark Rd at 0.4 miles followed by Enterprise Dr. Just past a marsh on your left spot an old RR mileage marker L20/M7 (Lawrence 20 miles/Manchester 7 miles). Cross Symmes Dr at 0.9 miles and travel past a commuter lot, then underneath I-93 at 1.2 miles before coming to Verani Way next to a scenic pond. Here you can follow Verani Way south out to Auburn Rd at 1.6 miles. The trail now travels alongside Independence Dr before crossing Liberty Dr where it heads into the woods. A spur on your left leads to the Independence Drive parking lot. Travel past a marsh on your right before passing another old RR mileage marker L18/M9 at 2.6 miles on your left. Travel underneath 2 large power lines before emerging at Route 28 after 3 miles where the trail currently ends. Future plans call for continuing the trail south along the undeveloped rail bed where it will eventually connect into the Derry Rail Trail . Currently a large gap exists between the South Manchester Rail Trail & Londonderry Rail Trail. The trail starts off a spur of South Beach Street. Heading north; The South Manchester Rail Trail is currently undeveloped. The next 1.3 mile section connecting into the southern terminus of the Heritage Trail is scheduled for 2018. Heading south; The spur passes by a parking lot before coming to the South Manchester Rail Trail along the old rail bed. The trail follows the old rail bed of the Boston & Maine Railroad. Here the paved trail is wide and shaded. Several spurs along the right side of the trail connect to local streets and at 0.3 miles you'll come to a spur trail on the left. Note; This spur trail takes you to Precourt Park, then loops back to the main trail. Continuing along the trail you'll pass by the southern entrance of the spur trail to Precourt Park. This brings you alongside Nutt Pond, with a couple of benches overlooking the pond. Just past the pond, look along your right and you'll spot some old railroad tracks paralleling the trail. The trail currently ends at Gold St after 0.8 miles. Note; The next mile south to Perimeter Rd and the Manchester-Boston Regional Airport is scheduled for construction in 2018. The final section south past the airport, where it will eventually connect to the Londonderry Rail Trail is currently under study .